On this date in 1991, the Detroit Red Wings held a pregame ceremony where they retired Ted Lindsay's #7 sweater as well as the #10 of Alex Delvecchio. Delvecchio left no doubt that he was ready to play in the NHL following his first and only season in junior hockey when he led the Ontario Hockey Association in assists with 72 in just 54 games. 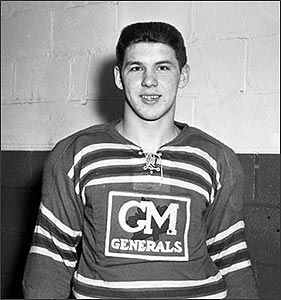 Not only a playmaker, the talented Delvecchio also scored nearly a goal a game for the Oshawa Generals as well. His 49 goals added to his league leading 72 assists gave him an impressive 121 points for the season and second place in the scoring race. He made his NHL debut that same season with a single game for Detroit. The following season of 1951-52 could not have gone any better for Delvecchio. After six games in the minors, in which he scored nine points, he was called up to Detroit. He scored his first NHL goal, as one of the 15 he would score that season, and played 65 games with the Red Wings before advancing to the playoffs, where they would sweep eight straight games to earn Delvecchio his first Stanley Cup in his first full season of play. "That was a great team we had and I felt proud to be among so many players that were true stars of the game. Terry Sawchuk was in goal and in those eight playoff games against Toronto and Montreal, he only gave up six goals. We had Ted Lindsay, Sid Abel, Gordie Howe, Glen Skov, Tony Leswick, Metro Prystai and Marty Pavelich up front. Marcel Pronovost, Red Kelly and Bob Goldham were three of our defensemen," Delvecchio remembered. His point total would jump from 37 to 59 in his second season, powered by 43 assists as he was paired with none other than Lindsay and team leader Gordie Howe on the second version of "The Production Line" following the trade of line member Sid Abel. The 59 points would stand as his career high for seven seasons. While his personal point totals would drop in 1953-54, greater things were in store for Delvecchio than personal glory, as the Red Wings would win the second Stanley Cup of Delvecchio's career. He would contribute 9 points in 15 games in the postseason. Delvecchio may have began to think that winning was easy following the 1954-55 season, as the Red Wings again marched through the playoffs to win their third championship in Delvecchio's four seasons as he chipped in 7 goals and 8 assists in 11 games for third in team playoff scoring. It would prove to be the final Stanley Cup of what would eventually stretch to a 24 year career. The 1955-56 season saw him record the first 20 goal season of his career when he netted 25 . The Red Wings would once more reach the finals that season, but fell short against the Montreal Canadiens, who were just beginning a dynasty that stretch for five seasons. 1956-57 was cut short by injury, one of the rare seasons Delvecchio would play less than 70 games, although he was still productive while healthy, scoring 41 points in 48 games. Aside from 1956-57, Delvecchio would play in 1,050 out of 1,054 possible games between 1952-53 and 1967-68. Following the 1958-59 season, Delvecchio would be named the winner of the Lady Byng Trophy following his 54 point season which saw him whistled for just 6 penalty minutes. 1960-61 was the beginning of six consecutive 20 goal seasons for Delvecchio. He was then named team captain of the Red Wings for the 1962-63 season, a post he would retain for 12 years, the longest in team history until eventually surpassed by Steve Yzerman. The 1965-66 season was a memorable one for Delvecchio, highlighted by the only 30 goal season of his career, when he scored 31. That season would also be the fourth return to the Stanley Cup Finals in six seasons for Detroit. His season was capped off by being named the recipient of his second Lady Byng Trophy. Three seasons later Delvecchio set a career high in points with 25 goals and 58 assists for 83 points, including the 1,000th point of his career on February 16, 1969, only the third player in league history after Howe and Jean Beliveau to achieve that feat. His efforts were recognized with the 1969 Lady Byng Trophy, the third of Delvecchio's career. The final four seasons of his career were as productive as any that came before, with the final full season seeing his second highest point total of his career. Although it was one of the rare seasons in which he did not score 20 goals, coming up just short at 18, he had his second highest assist total with 53 for 71 points. Delvecchio retired as a player following 11 games of the 1973-74 season when he was chosen as coach of the team. At the time of his retirement, he had established an NHL record for the most games played in a career with only one team at 1,549. In those games, he scored 456 goals and 825 assists for 1,281 points. Additionally, he played in 13 All-Star Games, a total only five players have ever surpassed. He was inducted into the Hockey Hall of Fame in 1977 and His #10 was retired on this date in 1991. Today's featured jersey is a 1968-69 Detroit Red Wings Alex Delvecchio jersey. 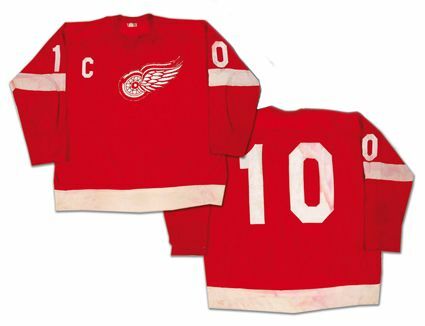 This jersey features the captain's "C", which Delvecchio wore longer than any other player at the time and still remains the second longest tenure of any captain in Red Wings history. 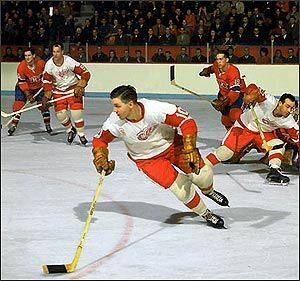 This style of Red Wings jersey was first adopted in 1932 when the team changed their name from the Falcons to the Red Wings and remains essentially unchanged to this day. Here are highlights of the 1954 Stanley Cup, when the Detroit Red Wings battled the Montreal Canadiens as well as a lively panel discussion with members of both teams hosted by the great Curt Gowdy. Nice blog! I stumbled in here while doing a google image search on JLA banners... and stuck around to read your Delvecchio post. You do good work, TSG. Thanks for the compliment and taking the time to leave a comment. That means a lot to us. A large percentage of our traffic, if not a majority, comes from people doing image searches. If you are a Red Wings fan, check our labels section of links on the bottom of the right hand column for two dozen other entries to date tagged "Red WIngs".